And this week’s (Aug 30-Sept 5, 2013) movie of the week is… City Lights! It was only this past year, sadly, that I had ever watched a full-length Chaplin movie. Now I’ve watched three and love every one of them. I threw this movie in the mix thinking it didn’t have a chance, especially against The Wizard of Oz. But City Lights was the little movie that could this week and deserves the big win. If you’ve never seen it, see if you can find it streaming online. By the way, I should address this form of movie watching for the benefit of those who don’t know how. There are many sites that offer free movies streaming, though how do I know which one is good to use? Well, the answer to that question changes from month to month. I used to use Surf the Channel, but it’s no longer in operation (that I know of anyway). Currently I use TubePlus a lot. Now there’s a trick to it. Unfortunately it is rarely as easy as click-here-to-watch-your-movie-for-free. Usually you have to get to know which links to click and endure the tedious task of closing pop ups, and yes many or most of them potentially offensive. Really, I think the best thing is to find a friend who watches movies streamed and ask them to show you how. It’s frustrating at times, but so work getting to see some old classics. I have no idea how I would ever get the chance to see these Chaplin movies without it. …back to City Lights. I LOVED watching this movie. It was, admittedly, a little strange at times. After all, it was made in 1931 when my grandfather was a preteen. There is bound to be some cultural/generational dissonance, but not enough to make me want to turn the screen off. Chaplin, as you probably know, was a master at physical acting. I’m not even sure anyone has come close to him in these 70 or so years since he was active in film. I really think everyone needs to see him perform either in a movie or a short at least once in his/her lifetime. Remember when you watched a movie that brought out a wide range of emotions? Perhaps it was the music. The words spoken and, more importantly, how they were spoken. The cinematography of beautiful landscapes. Chances are it was a combination of all of these things. Chaplin didn’t have the technology for brilliant visual or audio effects. There is pleasant music played throughout the movie, though he doesn’t get to utter a single word. Yet you get that variety-of-emotions experience anyway. Did you like watching Johnny Depp playing with his food in Benny n Joon? Do you think it’s cool to see all the stunts Jackie Chan does in his action movies? How about Jack Tripper wrestling with a hammock on Three’s Company? How about just about any of Jim Carrey’s comedies? If you answered yes to any of these, thank Charlie Chaplin. In this movie, he doesn’t just make dancing both funny and impressive, he makes a work of art out of everything from eating, to smoking (and putting out an ensuing fire), to buying a flower, to competing in a boxing match. And it’s not just his agility, timing, and coordination that we’re talking about here. His expressions do more than any spoken words in a thousand other award-winning movies. In any comedic scene of any movie, it’s often the expression of the actor that makes it so funny. 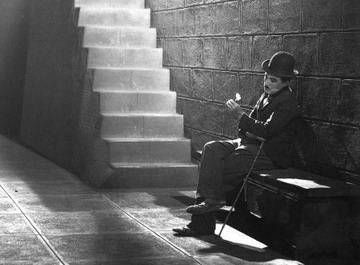 If there is another actor who can do this any better than Chaplin, I don’t know who they are. And the way he looks lovingly at the woman he falls for–in more than one scene–is unforgettable. But this review is saying more about Chaplin than the actual movie. The story of City Lights is magnetic, not to mention very original. At the moment, I can’t think of another movie that has used a similar plot. And consider the fact that this is a silent movie and it sits at the #38 spot on IMDb’s list of best movies rated by hundreds of thousands of users worldwide. Congratulations, City Lights. This is your week. As for the runners up, The Wizard of Oz is one powerhouse of a movie. It has more lines that have made their way into pop culture vernacular. “Follow the yellow brick road… I don’t think we’re in Kansas anymore, Toto… There’s no place like home.” (I could go on.) And absolutely no one can hear, the words “Lions and tigers and bears,” and not finish the line. In fact, you’ve done it already in your head, didn’t you? I was one of the many kids who watched it, loved it, and had nightmares about the flying monkeys. And for the record, one of the munchkins did NOT hang himself on the set. A big crane did get loose, however, which is what is seen in that legendary shot. Gone with the Wind. Now I have to admit that it’s been years since I saw the movie, and I wasn’t crazy about it. I know it’s a good movie and that it was groundbreaking, but I really need to watch it again. Nonetheless, it’s more than obvious that this film was enthralling to its original audience, and still is to today’s viewers. It was also culturally significant and put together some of the most iconic performances in movie history. Actress: A tough call between Vivien Leigh and Judy Garland, but if it’s up to me, I pick Judy. My daughter, Erika (the other movie lover in our household) does a great impression of her. Actor: Enough praises have been sung for good ol’ Charlie. Let’s give this one to Clark Gable. I loved how many people responded to this week’s picks on Facebook. I thought there wouldn’t be enough people who cared about movies from eighty years ago. Looks like we all can appreciate a good movie when we see one, regardless of its age. And to think, someday people will watch Lord of the Rings and Star Wars and view them the same way. 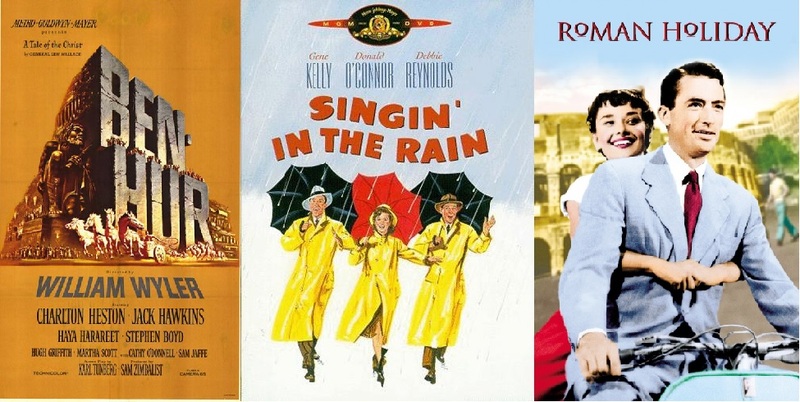 Which do you think should be declared movie of the week? And feel free to nominate best actor/actress and quote. 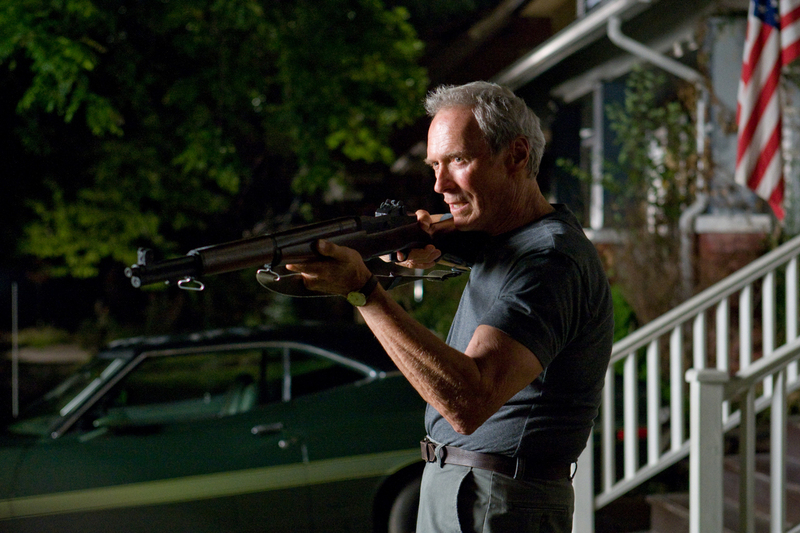 And this week’s (August 23-29) movie of the week is… Gran Torino! Maybe Clint didn’t win last week with The Good the Bad and the Ugly, but he won big with this one. If you didn’t watch this one… Wait, that reminds me of something. As a quick aside, sometimes people will tell me that they’ve only seen one of the movies selected, or perhaps they didn’t get involved because they hadn’t seen any of them. Allow me to shed some light on this situation. And another quick aside, it is a huge huge pet peeve of mine when people say “shed some light on the situation” when they turn a light on in a room. If this is you, please stop! Now back to the first aside, you can vote no matter what you’ve watched or not watched. For instance, you might say to yourself, “I’m going to pick this movie because the actor in it is one of my favourites,” or “It was dreary, rainy day today and this movie has the word “rain” in it–gets my vote. Most of us will pick the ones we enjoyed the most, but just so you know, you’re not disqualified as a result of missing out watching any of the picked flicks. Back to Gran Torino, if you haven’t watched this one, you would have a freaking awesome weekend if you went out and rented it now. I would recommend watching it on Netflix, but I don’t think it’s on there.. This is one of those movies that you can watch alone and it wouldn’t matter. The first thing that I would say makes GT a winner is its treatment of racial dissonance and broadening one’s perspective. It comes across as highly non-politically correct, and though most of us claim to hate political correctness, we often cringe when people and situations are not. The first half hour of the movie makes viewers cringe to the point where they feel bad for continuing to watch. But then you get over it. Don’t get me wrong, it doesn’t mean you suddenly become tolerant of racism, nor do you get “numb” to it (kind of an overused term and I’m not 100% sure what it’s supposed to mean), but you settle into the character’s perspective, where it came from, and where it could be going. This brings me to what I think is the element of the movie that I believe sets it apart: the main character. There are many great characters in movies and TV. There’s the Fonz, Captain Jack Sparrow, George Castanza, Tyler Durden, Kermit the Frog, Ellen Ripley–memorable, lovable, and most of all, they win us over by simply being who they are. I have always felt that the best character in TV history is Archie Bunker. Ironically, he is a lot like Eastwood’s character. Walt Kowalski, is a retired Korean War vet and he is in a perpetual bad mood. He’s old, crotchety, and outrageously prejudiced. But you love him, even early in the movie. Why do we love the grumpy old man character? More specifically, why do we love the close-minded, irritable grumpy old man character? Maybe it’s because he reminds us of someone we know. Throughout life, change is inevitable. Could it be that loving these crusty, grumbling fools (just thought of another one–Carl Fredricksen from Up) give us that weirdly comforting feeling of embracing the need to move ahead with change while still recognizing the beauty and value of our past in spite of its contentious and musty faults. Oh, thought of another one: Stanley Roper. Congratulations Gran Torino, it’s your week. Of course, we must acknowledge the two runners up. It should be noted that though Gran Torino was released in 2008, it did not get win (or even get nominated for) best picture at the Oscars. The winner that year was Slumdog Millionaire. This movie was both culturally insightful and refreshingly hopeful. It also possesses one of the greatest soundtracks in all of movie-dom, in my humble opinion. And Eternal Sunshine is a movie that really makes you think. For starters, like Inception, you have to be careful to pay attention in order to keep up. But more importantly, it asks questions without actually spelling the question out for you. Just by watching you are faced with thoughts and feelings to wrestle with. LOVE those kind of movies. And the Oscar goes to: Actress: How can it not be Kate Winslet? She is, without a doubt, one of the most accomplished and talented actresses of our time. This one was a role that was so different from anything else I’d seen her play. Actor: Well, Clint won last week, but I’m afraid he’s going to have to give it up for Jim Carrey this week. I remember thinking that it was strange that Carrey wasn’t nominated for his role in The Truman Show. Then when he wasn’t nominated for Man on the Moon, well that was just plain stupid. But the straw that broke the Oscar trophy’s back was the snub he got after playing Joel in Eternal Sunshine. This was Carrey’s crowning performance, which says a lot–have you seen Man on the Moon?? Forget that, have you seen Dumb and Dumber?? Oh, the 00’s. A great decade. And now maybe you have more of an idea why everyone loves Dr. House so much. Also: feel free to nominate best actor/actress and quote. This week’s (August 16-22, 2013) is… Psycho! The Good the Bad and the Ugly is the ultimate “spaghetti western.” Btw, if you’ve ever wondered why they’re called this, it’s not because people sit back and eat spaghetti while watching them. It refers to the fact that they’re Italian-made. Sergio Leone, an Italian, made this classic with a cast that, for the majority, did not speak any English. I was drawn in by not only the story, but the characters, the dusty, western theme (the clothes, the music, the backdrops–only Once Upon a Time in the West can compare (another Sergio Leone movie. Oh, and my favourite thing about this movie is that in the scene where you see a skeleton, it’s real! That’s right. And whose ideas was it to have a real human skeleton in the movie? Well, it was hers–the person who once carried those bones around in life. A spanish actress had made a request before her death that she act in film even after she’s dead. She got her wish. I know what you’re thinking… Why isn’t THAT movie called Psycho? But Good/Bad/Ugly is truly a great. It not only almost took the prize, it deserves it. It sits at the impressive position of 5 in the top 250. Pretty amazing when you think of the gazillion movies that have been made in the last century. Two elements of this movie stand out in my mind. The first is that it not only scared the pants off of movie watchers in 1960, it STILL makes people jump. Sure, our movies having gotten more shocking, bloodier, scarier, but this story and its assisting visual/audio effects is done so well that it doesn’t matter how numb you are to shock entertainment. Now that’s not to say that it’s overly gratuitous in its depiction of violence and horror. In fact, it is very tame. Hitchcock’s timing and choice of camera angles, music, sound, etc. is simply perfect. He doesn’t need anything else to try and raise the hairs on the back of your neck. Second, Psycho gets the job done with nothing but what Hitchcock calls “pure cinema.” I won’t allow any spoilers to sneak out here, but there isn’t a single character that you get attached to and follow. There’s isn’t a single superstar actor (up until the movie was released, that is–it made a star out of Anthony Perkins) that keeps the audience is watching. It’s just the story told through the medium of cinema. Awesome. Congratulations Psycho, it’s your week. Actress: Lila Crane. She makes acting look easy and her scary shower scene is iconic. Actor: Clint Eastwood. We don’t get to hear him say, “Do you feel lucky punk?” or “Go ahead, make my day,” but his character is just as smooth and devilishly confident as these lines. Though I always wondered how a guy out in the desert had such an endless supply of smokes and matches. So if this week doesn’t make you wanna eat popcorn and get scared on purpose, I don’t know what will. I dedicate this week’s movie pick to all the psychos I know, and there are many. May your psychotic ways never harm but always entertain.